The Ambassadors of Children's Hospital Los Angeles are an inspired group of community leaders that raise critical funds for the life-saving care, education and research that have given hope to generations of families. Together they support the hospital by personally giving or fundraising thousands of dollars a year. Ambassadors are offered special opportunities to learn more about our hospital and participate in meaningful ways that bring them closer to the hospital's mission and community. Tours, doctor and researcher speaking events and special outreach and leadership opportunities are just some of the ways that Ambassadors can participate. 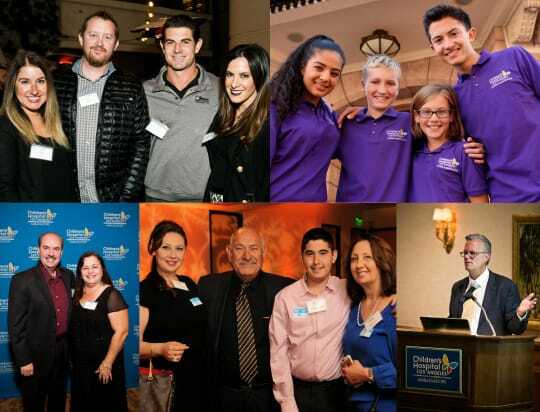 Individuals who annually give or fundraise $1,000 or more in support of Children's Hospital Los Angeles are members of the Ambassadors family. Ambassador Committee Members embody the heart and soul of Children's Hospital Los Angeles and links the community to our mission. Members advance awareness and help prepare future generations by building the financial strength of Children's Hospital Los Angeles. The Armenian Ambassadors of Children’s Hospital Los Angeles are a group of community members, organizations and businesses dedicated to creating hope and building healthier futures for all children. Our goal is to help ensure that Children’s Hospital has the best resources to care for our children. We are grateful for the opportunity to share our philanthropic heritage with Children’s Hospital by giving back to a community that has welcomed our families. The Emerging Leaders of Children's Hospital Los Angeles is a network of young professionals inspired to support CHLA. Comprised of dedicated Ambassadors, we add our voice to the great mission of our hospital and contribute to the richness and history of the Children's Hospital community. By becoming an Emerging Leader, you help ensure all patients receive the very best lifesaving care they need. The Endocrinology Ambassadors of Children’s Hospital Los Angeles are a growing community of grateful patient families -- moms, dads, children, siblings, grandparents and friends -- committed to working together to help ensure that children and families living with endocrine disorders receive world-class pediatric care. We are a community of families and friends of the Heart Institute at Children's Hospital Los Angeles, inspired to fund initiatives that will improve and revolutionize pediatric cardiology today and for future generations. The Junior Ambassadors of Children's Hospital Los Angeles are kids and teens from the community who support the hospital’s life saving work. The program offers kids the opportunity to work together and become incredible hospital representatives and fundraisers. It’s a powerful and inspiring model of kids helping kids. The Neurosurgery Ambassadors of Children’s Hospital Los Angeles (CHLA) are a growing community of grateful patient families and supporters who know firsthand that it takes a special team of experts to provide the very best care for children who need neurosurgery. Thanks to the commitment of philanthropic funders, known as our Partners in Play, Child Life services are integrated into the holistic and family-centered care at CHLA. We are committed to growing the Child Life Program through generous support and creating a $10 million endowment to secure this exceptional program forever. Start a page, support a Cause and join our community of caring fundraisers! Learn more.